Most Lawn Companies... And How Dr. Green Lawn Care Overcomes Them All." Don’t Call Another Palm Beach Lawn Service Company Until You READ THIS FIRST. Hello, my name is Cecilio Rivera. I’m glad you stopped by our Boca Raton lawn care service website because I’m going to share with you the 3 most important things you need to know before hiring a lawn service company. This will help you avoid headaches and unpleasant surprises. 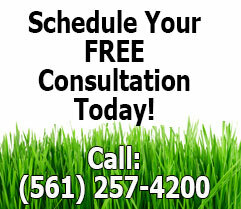 I understand how important it is for you to have a well groomed and healthy yard. Your home is your biggest investment and I know curb appeal plays an important part in determining the value of your home. You want your home and property to look its very best, and it should. But it takes the right kind of people with the right kind of training, dedication and equipment to do the job right. Make sure the lawn guy or lawn service you hire is licensed and insured. If they get hurt while working on your property you want to make sure they are responsible and not you. This is overlooked many times but it’s important for your piece of mind so don’t be shy to ask for proof. Make sure you get an estimate in writing. No reputable Boca Raton lawn service company will quote you a price over the phone. If they do that’s your first red flag that they’re going to pull a “bait and switch” tactic on you. A reputable Boca Raton lawn service company will first come by and look at your yard and walk around your property to give you a fair price for the work that needs to be done. Are they a “jack of all trades?” Here’s what I mean… It’s not uncommon for many lawn service and landscape maintenance companies to do everything under the sun. They pressure clean, paint, clean gutters, and do a host of other things that have very little or nothing to do at all with lawn and yard maintenance. Many times less is more. A company that strictly focuses on lawn and landscaping will do a better job keeping your yard in tip-top shape than a jack of all trades who is being pulled in all directions. I thought I had 3 important things to point out to you, but this fourth one is the most critical – Ask them if they have an unconditional money back guarantee. If they look at you funny or start giving you a “song and dance” there’s another red flag. A reputable and professional lawn service company that is proud of their work will not hesitate to put their money where there mouth is. They will make sure you are 100% satisfied or will give you your money back. If you have any questions or need additional information, please feel free to call me at (561) 257-4200. I’ll be happy to answer your questions and discuss your concerns. Please keep in mind we work with noisy equipment and there are times I don’t hear my phone when I’m out in the field. If you call and get my voice mail, please leave your name and telephone number and I will call you back as soon as possible. Thank you once again for visiting my website. I’ve prepared all this information to help you make a sound decision when choosing a residential or commercial Boca Raton lawn service company. So browse around and don’t hesitate to contact me if I can be of service to you.